The first two Katamari games, produced by future playground designer Keita Takahashi, were memorable for inventing a new style of play while railing against rampant consumerism. Players rolled a sticky ball across carpets and pavements gathering up the flotsam and jetsam of everyday existence, and the ball would grow in size until it could roll up the carpets and pavements themselves - and then cars, houses, fields and eventually countries. They were funny, beautiful and intelligent games with gorgeous soundtracks, and we loved them dearly. Once it became clear the joke was lost on his employers, however, Takahashi buggered off to do something else, and without him Namco Bandai proceeded to make so many sequels and to produce so much merchandise that the metaphor eventually consumed itself. 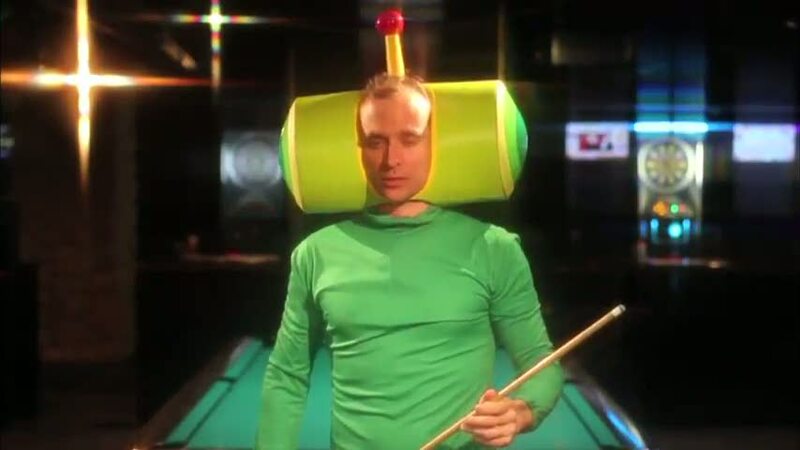 So much so, in fact, that if Takahashi were to come back and make a new Katamari game today, it would probably have to include a level where you do nothing but roll up new Katamari games. Artistically the series has pretty much snookered itself. Still, that's never stopped the games industry before, and so here we are with Touch My Katamari for PlayStation Vita. As with the other games, albeit now devoid of subtext, the mighty King of All Cosmos needs you to go around the world rolling katamaris of varying size. You start off with a couple of minutes to make one a few centimetres across, collecting drawing pins, erasers, coins and nail clippers, and over the course of a few hours' play the amount of time and the desired size of the katamari increase exponentially until you have around 10 minutes to make something big enough to roll over cities and pluck jumbo jets out of the sky. There are a few changes to the formula, but only minor ones. One level changes the context from size to calories, so you concentrate on collecting foodstuffs. Another sets the goal of making the biggest katamari possible with just 50 objects. Another still asks you to focus on particular types of creature, and ends the level prematurely if you snag even a single unsuitable object. They're all reasonable ideas, but there was a much greater and more imaginative variety available in 2005's We Love Katamari. Frankly even 2009's Katamari Forever did a better job. Gallery: Visually the game looks just like its high-definition siblings, with only a little slowdown towards the end of the campaign. In Touch My Katamari your success in each level rewards you with candy, which you can spend on unlockable music remixes (some of which are lovely) and use to access slightly different game modes. There's also a daily challenge set by the King, completion of which gives you even more candy, along with online leaderboards (again based on candy) and use of Vita's "near" system to spy on nearby users' top scores and compete for, you guessed it, extra candy by beating them. "The little details, like the silly noises everyone and everything makes when you gather them onto your katamari, are all present and correct." With a second analogue stick available for the first time on a handheld, Touch My Katamari can be played in exactly the same way as its predecessors - by pushing forward on both sticks simultaneously and easing back on either to turn. Katamari's other tricks, like a 180-degree turn and a dash attack, are also available. Touch controls are included as well, but they don't suit the continuous movement generally required to make the most of your available time. Probably the best Vita addition is the ability to change the shape of your katamari by using multi-touch pinches on either the handheld's front or rear panels. This allows you to flatten your katamari out into a rolling pin shape - helpful for quickly collecting a lot of similarly sized objects without making lawnmower runs back and forth across surfaces - or to narrow it into a tall, wheel-like shape, which moves faster across the levels' varied terrain and proves useful when you've grown to a large size and time is running out. It's a gimmick, but it does suit the game. And while Katamari's corporate benefactors can be accused of having long since missed the point by persistently commissioning new games in the series, its developers can't be accused of slacking off when it comes to populating the levels. The best examples are carefully organised networks of increasingly large objects that lead you through mazes of table and chair legs, over sideboards and out of windows into manicured gardens, onto streets and into parks, then back home to pick up the tables and chairs themselves. Touch My Katamari is completely in Japanese, so anyone with no experience of the series will struggle to get their head around it, although in practice it's very simple: collect things until you get bigger, then collect bigger things. When not doing this, remember to laugh at the silliness. For better or worse, people who have played a Katamari game before will be able to figure it all out in seconds, although some of the secondary functions - like the "near" features and shopfronts - will require a bit of experimentation to unravel. Very rarely do you run out of suitable objects to collect and they are still cute and whimsically amusing, like a pigeon sticking its head in a top hat or a bodybuilder floating around a running track on his back doing sit-ups. The little details, like the silly noises everyone and everything makes when you gather them onto your katamari, are all present and correct, and there are even a few Vita-shaped handheld consoles to snaffle - although they look sufficiently angular to be based on old prototypes rather than the slick console that shipped. Devoted players will be able to drag out the game's life by repeating levels to harvest more candy rewards that can be funnelled into its mixture of unlockables. You can even buy new hats and clothes for the King of All Cosmos, although his ruffle is firmly off-limits. Plus you can watch a series of cut-scenes starring a troubled otaku who fights his urges in order to achieve... something. Eventually he seems to transform into a happy salaryman with a wife and kid. There's a theatre section for reviewing these scenes, plus a PlayStation Store link for downloadable content and so on. It's all standard stuff, and that's become the problem. On the one hand, it means that Touch My Katamari is an enjoyable enough diversion for a few hours and nobody comes away shamed, as every box is checked for expected series and console functionality. On the other hand though, this approach also epitomises the series' greatest and most repeated failing in the years since Takahashi left: where once Katamari Damacy was an inventive and playful form of subversion, nowadays it's just a half-decent video game. Expect them to make another half dozen. Vita gets Street Fighter x Tekken and Touch My Katamari. Katamari, Ridge Racer, Shinobido lined up.